Trade Show’s quickly become seas of signage. 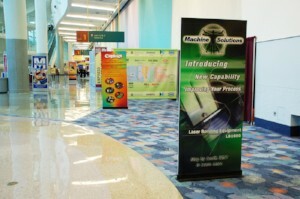 Banners and displays can at times become indistinguishable. A pull up banner is a quick and easy ways to add color to your trade show displays. The pull up banner range is the most popular signage solution because it is so versatile, installs quickly and easily, yet is compact. The banner graphic pulls up and retracts down keeping your banner protected! Many also favor this design because it is lightweight and portable.